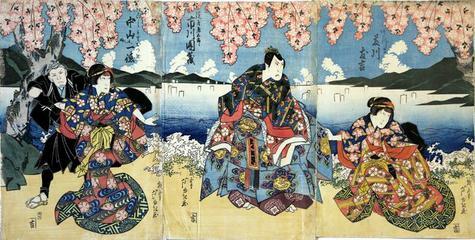 Keisei yanagi zakura (Courtesan, willow, and cherry: けいせい楊桜), which premiered in 1793 at the Naka no Shibai, was the first play in a series of "Yanagizawa dispute plays" (Yanagizawa sōdō mono) to dramatize events about Yanagizawa Yoshiyasu (1658-1714), an exceptionally influential advisor to the fifth shogun, Tokugawa Tsunayoshi (1646-1709). After a successful beginning in governance, Tsunayoshi began to rely on Yanagizawa, a samurai who became Tsunayoshi's most powerful minister for two decades and whom he made a daimyō of Sanuki and Kôfu in 1701. When the shogun's lax rule resulted in a devalued currency and increased taxes, Yanagizawa allowed his personal ambition to sway his judgment, failing to intervene. Tsunayoshi became more erratic and issued shōrui awaremi no rei ("edicts of compassion for living beings"), most notoriously extending protection to dogs and earning him the nickname Inu-kubō ("Dog Shogun"). The end came when the shogun's wife, Mi-Daidokoro, assassinated him and then committed suicide. Yanagizawa was blamed for many of Tsunayoshi's transgressions. This page displays three panels from a tetraptych. The complete tetraptych is also in the Lyon Collection. Reference: Ikeda Bunko, Kamigata yakusha-e shūsei (Collected Kamigata Actor Prints) Volume 1, Ikeda Bunko Library, Osaka 1997, no. 280, pp. 96-97. This shows the whole composition.